I have to admit that I often experience pangs of jealousy when reading my favorite blogs. It seems so many bloggers have wonderful little antique markets right in their backyards. Not literally in their backyards but, you know, really close to where they live. (Which is usually some place sunny and beautiful like California). I mean, is it fair that they get perfect weather, the ocean, and all the great flea markets? I think not. A few weeks ago I discovered a blog written by a sweet lady named Donna. 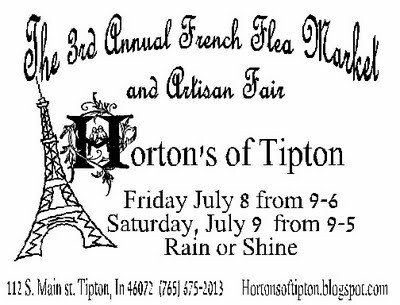 She posted about an upcoming French flea market, and I was beyond excited to see that it was taking place in a small town not far from me! So I don't have the perfect weather (there's currently a heat index of 110 degrees with stifling humidity), and I don't have the ocean but, by george, I've got a French flea market! My partner in treasure-hunting, Valerie, joined me for the market. We weren't sure how much shopping we'd accomplish, as we had five children in tow. However, the kids came up with a list of "scavenger hunt" items to look for at the market, and that (and some slushies) kept them quite content. All the vendors did such a nice job of turning their booths into mini-store fronts. This adorable couple runs Hot House Market. You can check out their blog here. They had some really fun pieces. The scavenger hunting slushie drinkers. We had a great time and look forward to next year's market. To learn more about this fun event, stop by Donna's blog. You had such a perfect day and the items look terrific. I like the basket and the kid you took home with you. He is definitely very, very valuable, as are all the beautiful children pictures. What fun. Yes, California seems to have the great outdoor flea markets. I hope to go to the Country Living Fair here in Atlanta in October. Never been before and another blogger may come go with me. I read all about this Market and since I am just over the border in Illinois, I wanted to go but it was too short notice. Thanks for sharing your pictures. 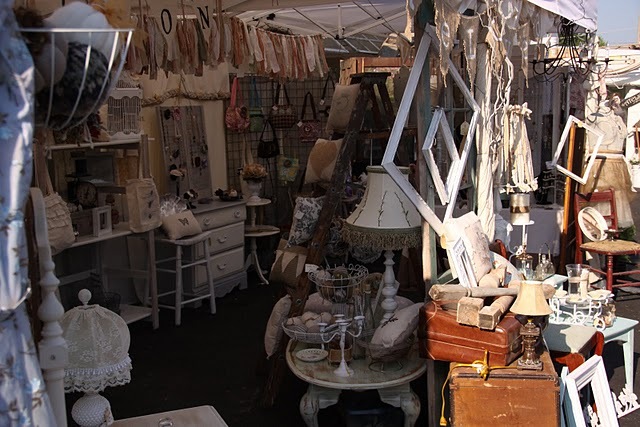 Don't you love how the vendors fix up their spaces like little shops? I really love the basket you brought home, very cute. The kids, too! Darling kids and basket. What a great idea to have a scavenger hunt. Brilliant, Carolyn! I would love to visit that French market in farm country! I think I live in the wrong place. so jealous! but thanks for the inspiration. Lots of cute things to think about! Such a wonderful way to celebrate summer! I love flea markets. Some of them can be really fun! You definitely went to a great one. I know you are in Indiana and I, in Illinois, but my friends and I made our annual trek to Shishewana in Amish Country. The have a flea market every Tuesday and Wednesday during the summer and a bunch of quaint shops. 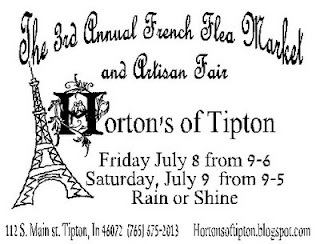 Being there many times, maybe a trip to Tipton is in order. The pictures look wonderful. Either way is three hours from the Chicago area. Let me know when the next one comes! BTW, your house reno is fabulous!